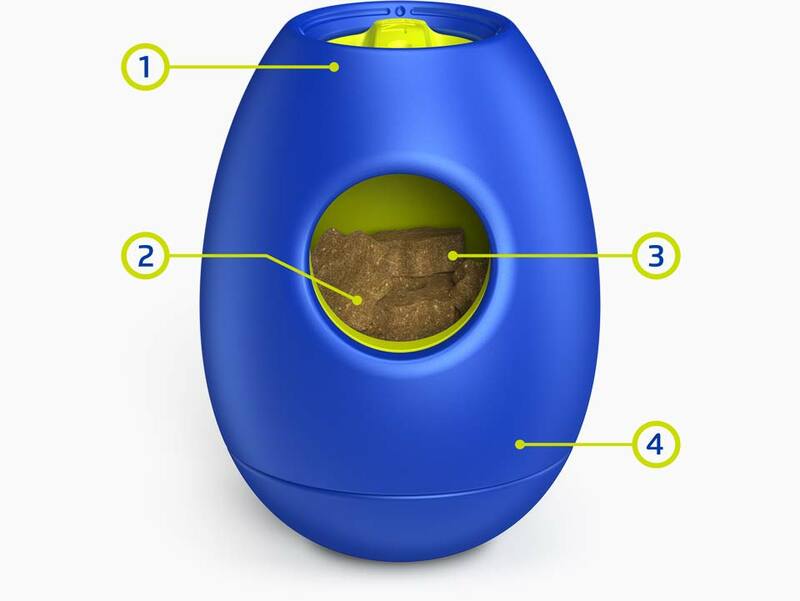 Tikr is less of an extravagance and more of a necessity (an interactive tool if you will) for your dog's overall well-being. Tikr solves the ULTIMATE problem - keeping dogs entertained for prolonged periods of time. 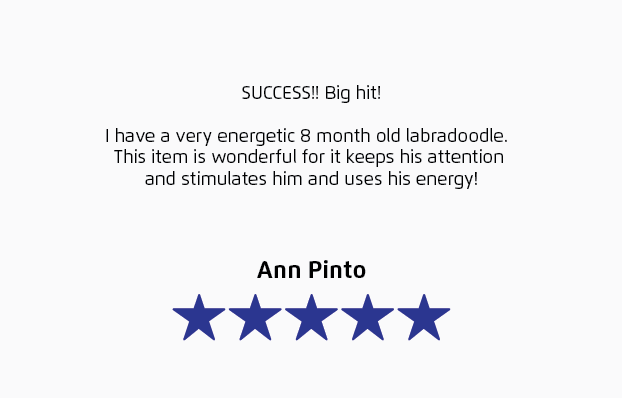 Your dog will be instantly captivated, and will enjoy exhilarating play... each and every time! Oh, and did we mention... tikr uses no electronics or batteries! Load tikr with a variety of snack sizes. Twist the dial to set the length of play time - up to 45 minutes! Keep'em guessing by randomizing the time. Play is continually rewarded as the timer unwinds, with bigger and bigger snacks being revealed. Small snacks keep the game fun, medium snacks are a nice surprise, and the big Kahuna is saved for the end! Snacks keep your dog curious and captivated. Specially designed tikr snacks are the perfect size. Tikr is an exhilarating activity toy with a "twist", delivering a MAXIMIZED snack experience, time after time, after time! 1 TIMER - Battery-free torque timer allows up to 45 minutes of non-stop fun. 2 SNACKS - Tikr snacks are uniquely shaped, sized to work perfectly with tikr's holes, and are available in fantastic flavors that'll make your dog flip! 3 SNACK CHAMBER - Holes line up as the timer unwinds, exposing the goodies inside. 4 MATERIAL - Tikr’s body is made from an FDA-compliant rubber-like elastomer that’s both flexible and durable. The Snack Tray inside is made from tough food-grade Nylon. X-ray view shows the snack chamber rotating... in super quick time! Careful consideration has been built into the design and engineering of tikr. We developed a specially formulated food-safe rubber-like blend, that's flexible, very durable, and easy on your dogs teeth and gums. In addition to tikr's tough materials, its egg-like shape limits chewing forces. Tikr was designed for interactive and supervised play, not recommended for overly aggressive chewers, and is suggested for small-medium sized dogs up to 50 lbs. Although tikr is designed to be durable and long lasting, to ensure a safe and enjoyable experience, it's important to pair tikr with the appropriate dog size. It also comes down to how aggressive of a chewer your dogs is... If your dog is a heavy/aggressive chewer, TIKR may not work well with your dog. Please be sure to monitor your dog closely, especially during the first few play sessions to judge your dog’s behavior and make any behavior corrections necessary. Think of an egg timer... no batteries required! Is tikr's outer shell made of plastic? After being disappointed with several plastic wobblers (which were very noisy, especially on wood floors) it became obvious tikr must be made from a rubbery material. We selected a pet safe TPE/TPR material that is tough and extra durable yet soft enough to be gentle on your dog's teeth - it's really the perfect blend. Is the material pet safe? Yes, but... it depends on the size of your dog. NO dog toy is indestructible. Tikr is not a chew toy and was designed for interactive and SUPERVISED play, and is recommended for small to medium sized dogs (up to 50lbs). Tikr is NOT recommended for aggressive chewers. Aggressive chewers should be watched closely until they fully understand how to use tikr. We suggest encouraging pursuit (nudge-rock-roll-chase) play styles, and limiting focused chewing behaviors. Take tikr away from your dog if they start gnawing or tearing at tikr and show them again how to use it. And, like any dog toy with holes, there’s a slight chance your dogs canine tooth and/or mandible could get stuck. Therefore, we strongly suggest monitoring your dog during play, and observe your pet's behavior with the toy to ensure suitability. Inspect the toy frequently; worn or damaged tikr toys should be removed and replaced immediately. If you think your dog has swallowed a piece of tikr, contact your veterinarian. Ultimately, your dog's safety is your responsibility. Can tikr be used as a "feeder"? You can totally place food/kibble in tikr. This is especially useful to slow down fast eaters and/or when you have to be away for extended periods of time. Because kibble may empty completely out of the small hole, our suggestion is to also load tikr with and at least one larger snack to keep the game going longer. What's all the "buzz-er" about? When time expires, tikr's buzzer will briefly sound. This may surprise your pup at first, but rest assured - they'll get used to it. Ruffly the size of the large-sized red K*** toy. 3.25" wide x 4.625" tall, and holds approximately 1 cup of snacks/food. We do not suggest placing tikr in a dishwasher. Hand wash tikr using a mild detergent and warm water/hot water. To clean the Snack Chamber simply swish the warm/hot soapy water around and/or use a brush meant to clean bottles. Once cleaning is complete, shake any remaining water out, and set tikr upside down to dry. This way, water won't make its way to the timer. How should I introduce tikr to my dog? A few pups out there may need a little encouraging, especially if they have never experienced a "treat-dispensing" toy or are aggressive chewers. First, try "loading your dog" by handing them a small sampling before placing the snacks in tikr. Have them watch you place the snacks in tikr and speak to them with enthusiasm! Second, once snacks are loaded, show them how it works - start in an open position and then roll it, shake it, bounce it, and allow a few snacks to fall out. This approach can also help relax heavy chewing desires. 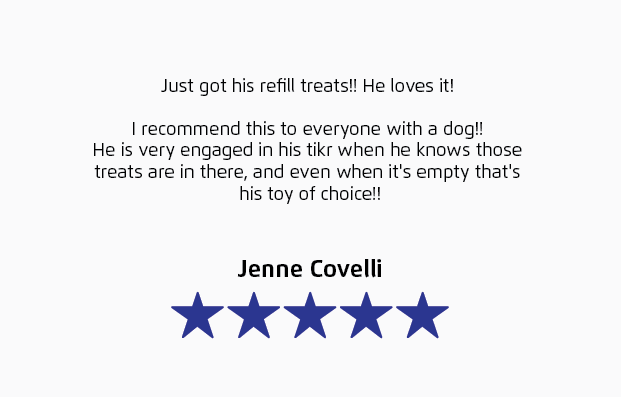 Once your dog discovers tikr provides them with food, they will be less likely to exhibit aggressive behavior towards tikr. Think of it like the saying goes... "don't bite the hand that feeds you". And, to keep them interested over a long period of time, try randomizing the timer setting - by doing this, your dog will never be able to anticipate when they will be rewarded. All that said, rest assured... they'll get it! Does tikr come with a guarantee? Once tikr has been returned to us (within 14 days from original order date), we'll provide a one-time replacement... no questions asked. Please reach us via our contact page for more information and to obtain a return form. If you purchased tikr from a Retailer, please return to their location. Tikr Snacks are non-refundable.